Imperial Gesture 1935/2013 was re-imagined in no small part due to the availability of photographer Barbara Morgan’s documentation. Now researchers will have easier access to her considerable archive of dance photos. The video below tells us more about this foundational American photographer. The Morgan family is proud to announce that the Willard and Barbara Morgan Archive has been acquired by the UCLA Library Special Collections at the Charles E. Young Research Library. library.ucla.edu/special-collections Finding aids for the archive are currently being developed. 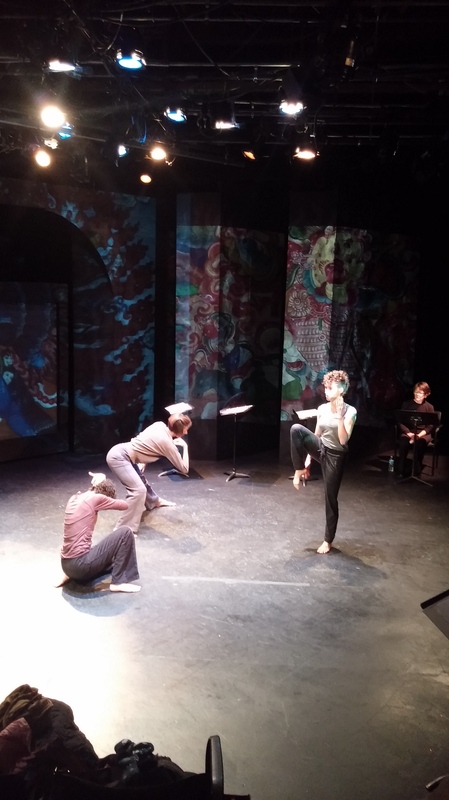 Geomancy is a multimedia piece that combines dance, lyric poetry and visual projections. Although it does not follow a narrative, there are seven distinct characters. The character of Elizabeth is emerging as an energetic history-loving traveler whose attraction to World War I battle sites has summoned her to Flanders. She is met by — or maybe she summons — six ghosts of soldiers and local women who join in her poetic exploration of the land and its landscapes of war. The women’s presence brings with it a separate kind of poetic language, that is, dance that is inspired by the lyric poems about the space they inhabited and still haunt. And the soldiers — Higgins, Fletcher, and Wood — challenge the audience to find the poetry in primary documents from the period — military manuals and reports form the field. One result of our collaboration are powerful moments created when dancers act, and actors dance. All week our actors have been working with several of AGA‘s movement scores, just as AGA has engaged in textual character analysis. This crossover of artistic practices — all inspired by the piece’s poetic text — has marked our process, and so will undoubtedly mark this developing production. The poetry merges with period texts, from trench songs to field manuals, and video projections of maps and monuments, all converging on the dance interpretation of AGA Collaborative. In the Great War, soldiers’ survival depended on their ability to “read” the landscape of the Western Front; Geomancy translates that idea into its own aesthetic language. 8 p.m., $5 suggested donation, 101 E. Cameron Ave., Chapel Hill, 919-364-0535. The Process Series. 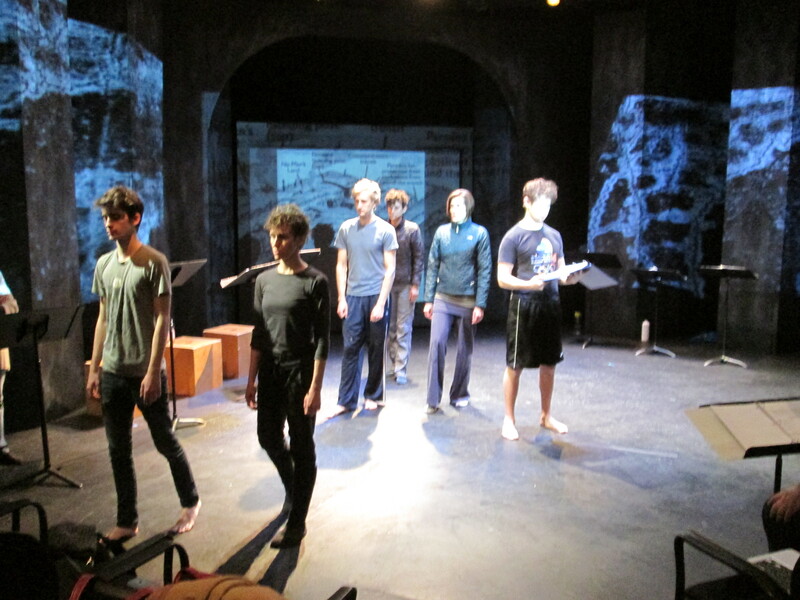 To generate a new piece, AGA Collaborative creates movement scores that come from a text or question of some kind. Scores for Geomancy come from the script, that is, the poems written by Elizabeth Gray and Elisabeth Lewis Corley. Since these poems concern the places, events, and soldiers of World War I Flanders, AGA experimented with embodying military movement to see what ideas it might generate. As Gretchen explains, the score, “Squint,” explores the idea that when watching soldiers march from a distance, the movement patterns seem utterly uniform, but that if you squint at that mass of movement in order to isolate one soldier, the variations of that individual’s movement become legible. Director Joseph Megel is asking all of the artists to take on all types of performance – everyone sings, acts, and moves in this showing. Pictured below, Gretchen, Amanda and Alison integrate our three actors–Jeb Brinkley, Peter Vance, and Brandon Rafelson–into the Squint score. This became a movement piece that Megel then staged as a counterpoint to the reading of a poem. The premiere showing of Geomancy: Divination by Geography will be presented this weekend by The Process Series in residence at the UNC Chapel Hill Communication Studies Department. 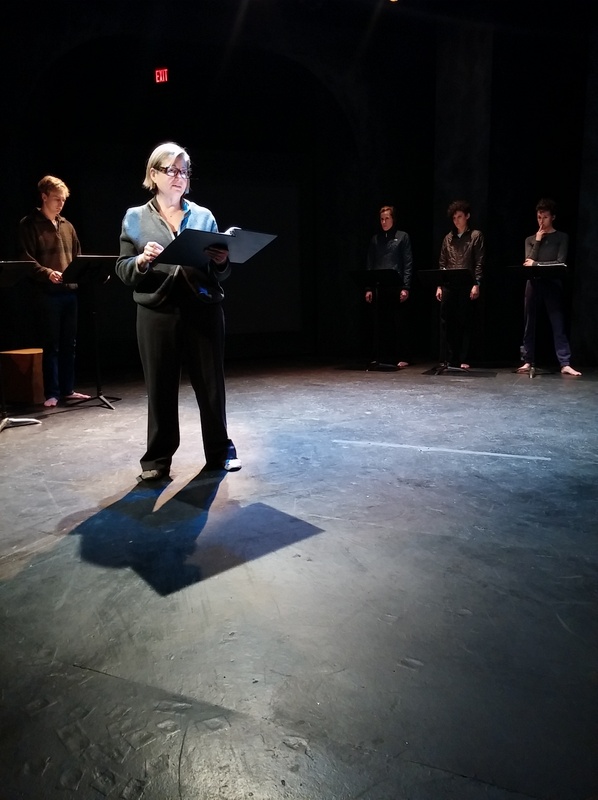 Geomancy is a new multimedia performance based on writing by Elizabeth T. Gray and Elisabeth Lewis Corley. Over the past few months, AGA Collaborative used Gray’s poem cycle about World War I to develop an original body of movement for the piece. 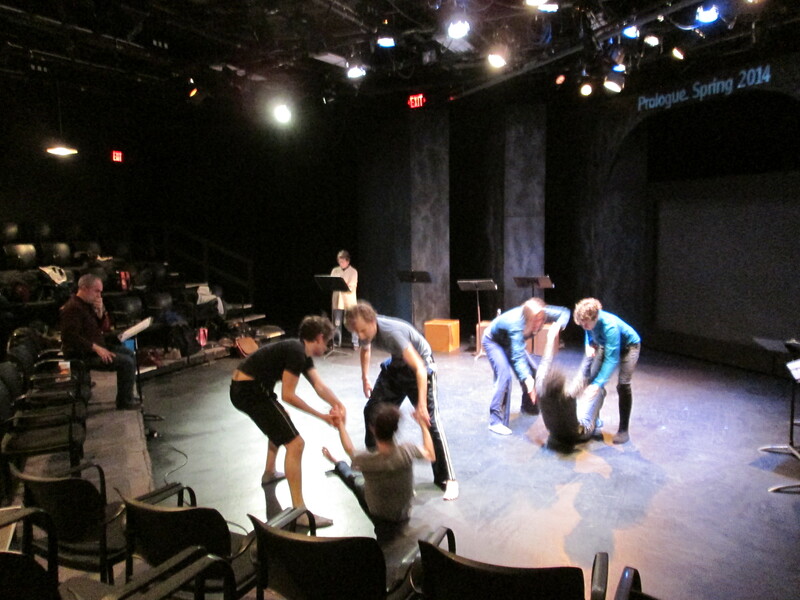 Our theatre department‘s commitment to developing new works includes involving our students in their faculty’s studio work, where they become co-researchers. 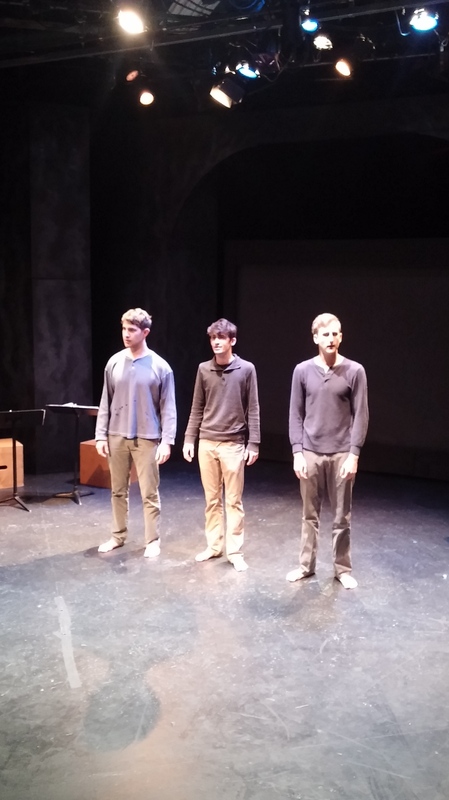 This past December, UNC Charlotte theatre majors Dylaney Edinger, Tony Heard, Kineh Ngaojia, and recent BA graduate Connor Pate participated in a reading & working session with AGA Collaborative and The Process Series. 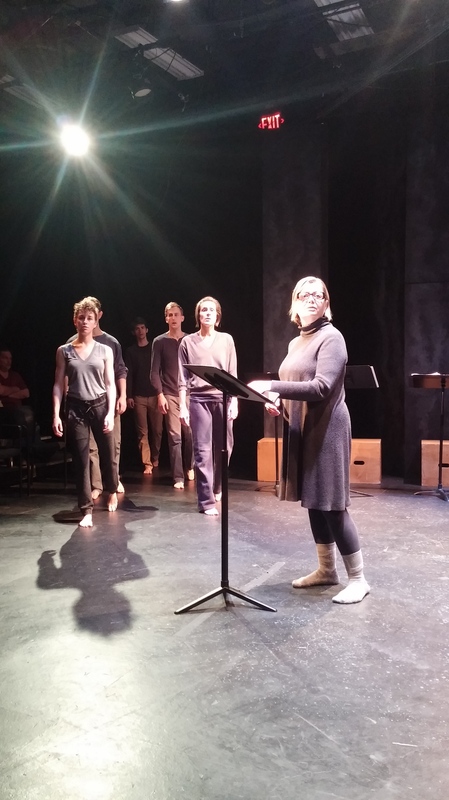 AGA led our students in movement exercises that helped director Joseph Megel and writers Elisabeth Lewis Corley and Elizabeth T. Gray, Jr. see the possibilities for how this multimedia piece might unfold.